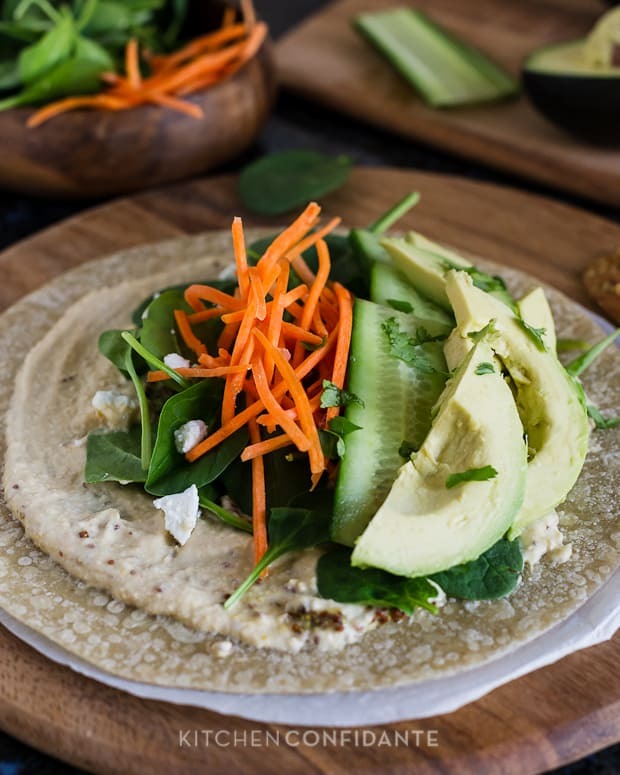 I’m sitting at my desk and trying really hard to concentrate on these veggie wraps but am extremely distracted right now. My nose is getting tickled by the tempting scent of Asian-spiced short ribs braising in the oven. I can’t even tell you how hard it is to think of veggies when the scent of beefy umami is swirling around the house. But let’s put that aside for a moment. 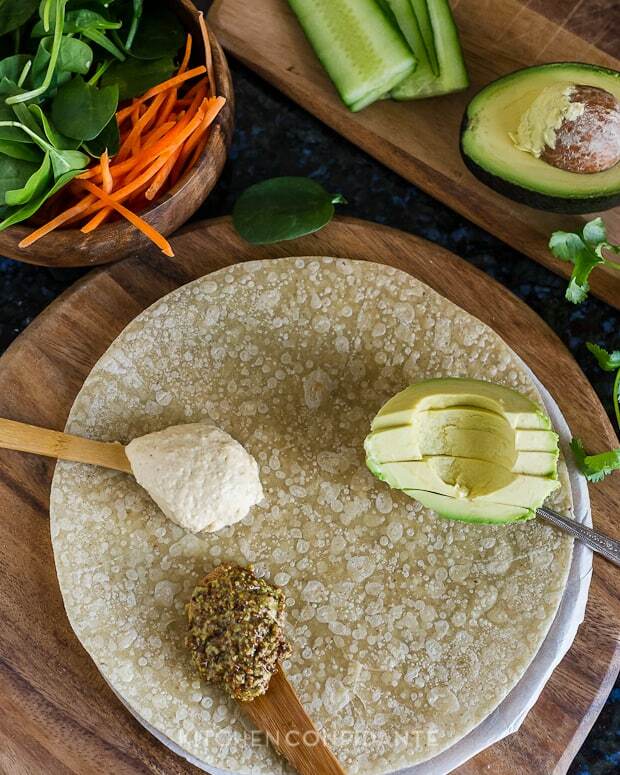 Because these veggie wraps need a little respect. I never really thought to share these so formally with you, they seem so ordinary, but I realized that they deserve some attention. After all, this is the food I eat. Quite often, in fact. My weekdays are, like yours, busy, and I like to keep it that way. And when lunchtime rolls around, a Veggie Wrap is what I crave. Not too long ago, I shared my lunch on Instagram, when one of my friends there asked if the recipe was on the blog. It was that moment that I thought, it probably should! These Veggie Wraps have been my favorite lunch the last several weeks. 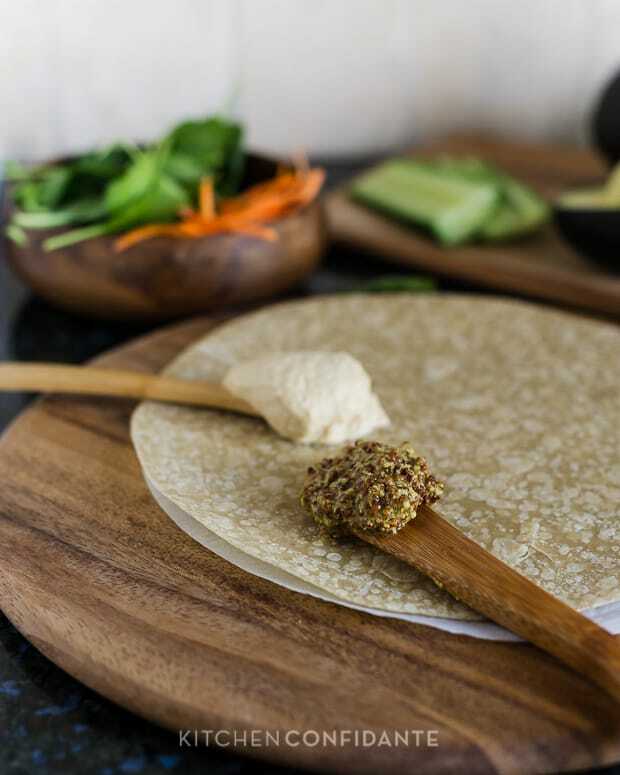 I just love slathering on thick hummus and speckled whole grain mustard on a tortilla and plopping my favorite fresh vegetables on top. Simple. Fresh. Healthy. And super satisfying. It’s no wonder I find myself eating this almost every day. What’s your favorite lunch? I’d love to know! 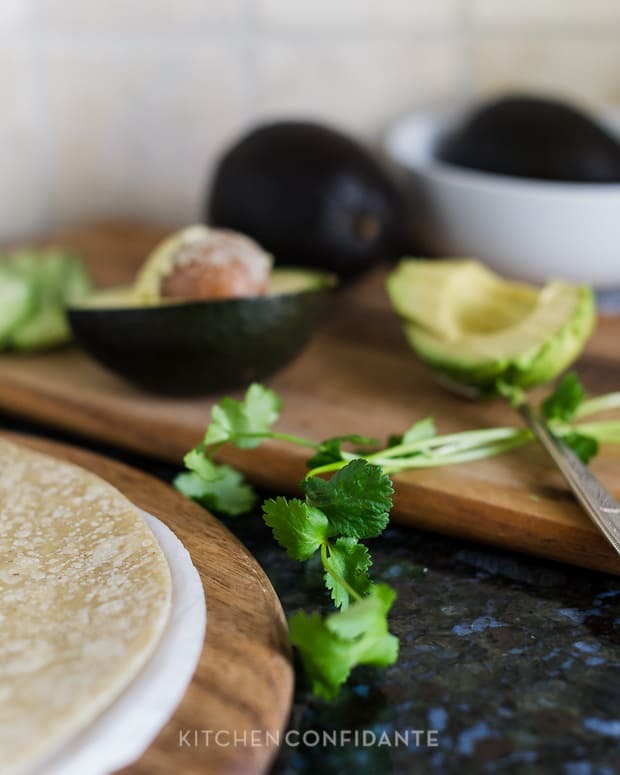 Spread about 1/4 cup of hummus on each tortilla, followed by 1 1/2 tablespoons of mustard, leaving a 2 inch border around the edge. Scatter the spinach over top, followed by cucumber, avocado, and carrots. Sprinkle feta cheese and cilantro. Roll the wrap and enjoy. I make these several times a week in the summer for lunches for the kids and I. 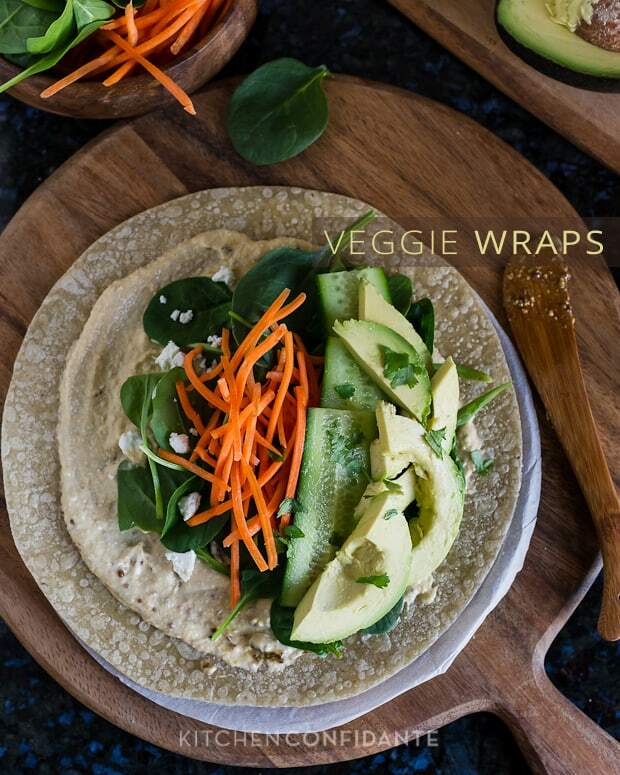 Love, love, love me some veggie wraps for sure. Sometimes it’s the simplest things we forget about even though we love them so much. These make me want wraps for dinner tonight. Isn’t that the truth? Simple things are so easily overlooked! Definitely a great healthy dish (though think now I’m distracted by the thought of short ribs)! Love these wraps, this looks like my daily lunch ;). A simple lunch cannot be beat. This is wonderful! Thanks for sharing your now not-so-secret lunches! 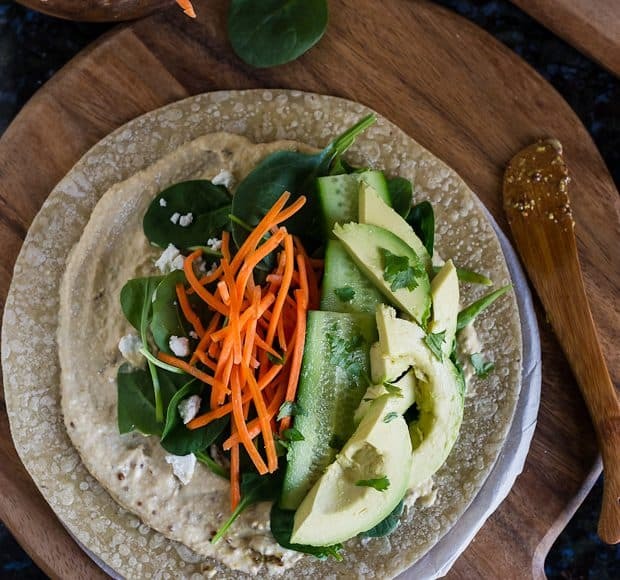 In college I used to live on veggie wraps (and various snack-y, much-y items!). 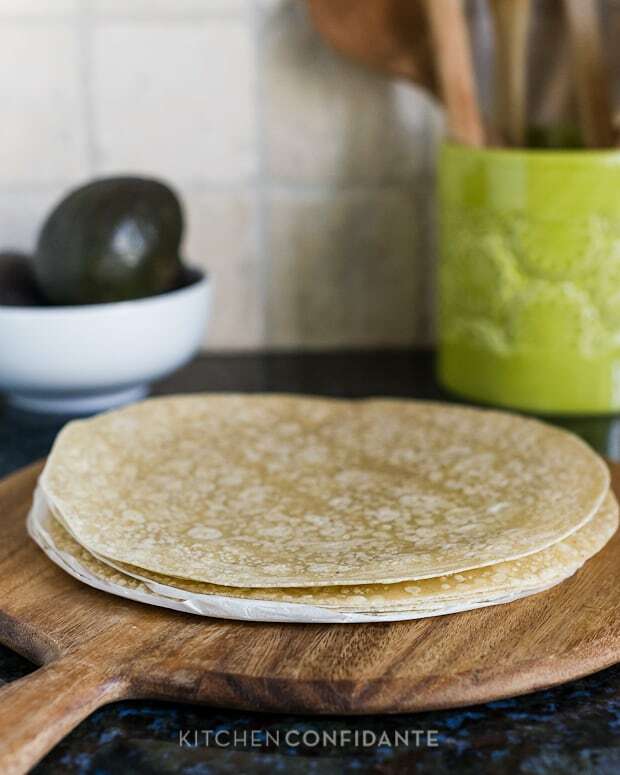 ;) It’s about time to return to the beloved simple, fresh wraps. Love your crisp, bright photos! This look so delicious! I bet I could get even my meat loving husband to try them! I can never focus when there’s meat braising. I’m officially on post-vacation detox and this lunch looks like the right answer. I know what you mean – this is definitely good detox food. I bet you couldn’t concentrate, lol. I’ve been so busy at lunch time, I’ve been eating a ton of wraps too. I like your hummus and mustard combo. I’ve been using a olive hummus I found at Trader Joe’s, I have to eat the whole thing because no one else around here likes olives, but I don’t mind. It really does have that briny olive punch. Hope you had a great weekend. Sitting here getting my calendar in order and now I’m thinking of lunch. Lol. I know what I’ll be doing when I go to TJ’s tomorrow – hunting down that olive hummus! Sounds fantastic! This looks so delicious and if you wanted I think a little grilled chicken would work perfectly in these! Definitely! That’s what I do for my family, since they love to have a little extra protein. stardt juicing. Okra is high in calcium and has 20% sodium content. cream. It is believed that the unique anti oxidant enzymes present in yams are responsible the increased cognitive response. beneficial addition too your healthy lifestyle. United States and Canada created a pathway for usage. when they’re flagged in one state’s system. recommended dosage from 4,000 mg (milligrams) to 2,600 mg.
while seeking help from your opiate addiction:. quickly absorbed into the bloodstream without going through the process of digestion. or diabetes. Effects: In low doses, Kratom looks stimulant-like, providing extra energy and endurance. The surplus cells so produced destroy good cells in the vicinity.